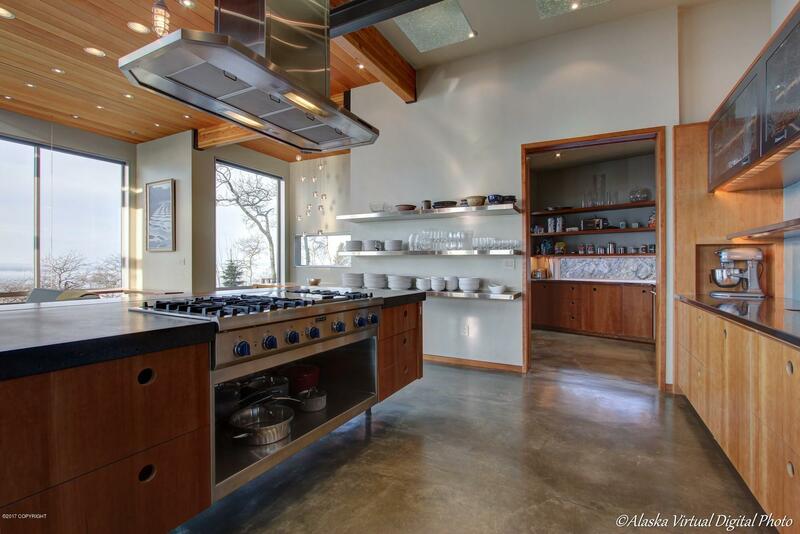 Two Thermador gas ranges and a 6 burner plus grill Thermador cooktop and Thermador dishwasher allow for gourmet feasts . 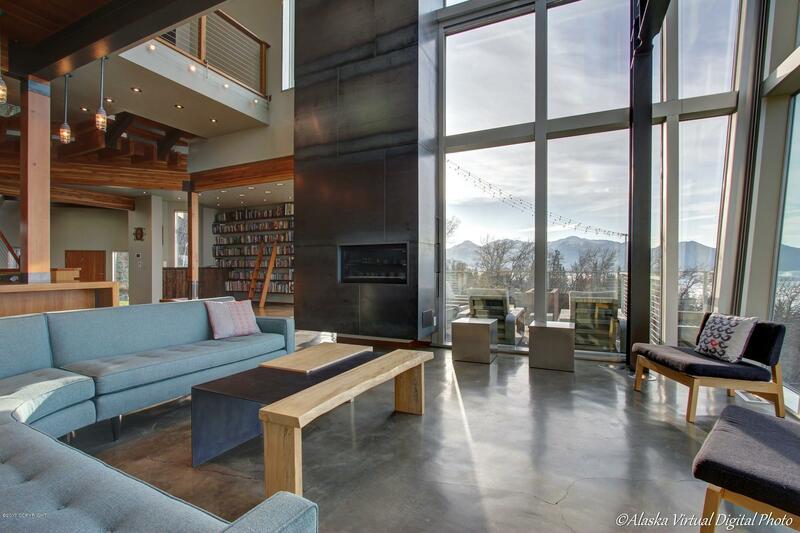 The home boasts stunning custom lighting including the Droog light fixture in the loft featured in New York's' Museum of Modern Art. 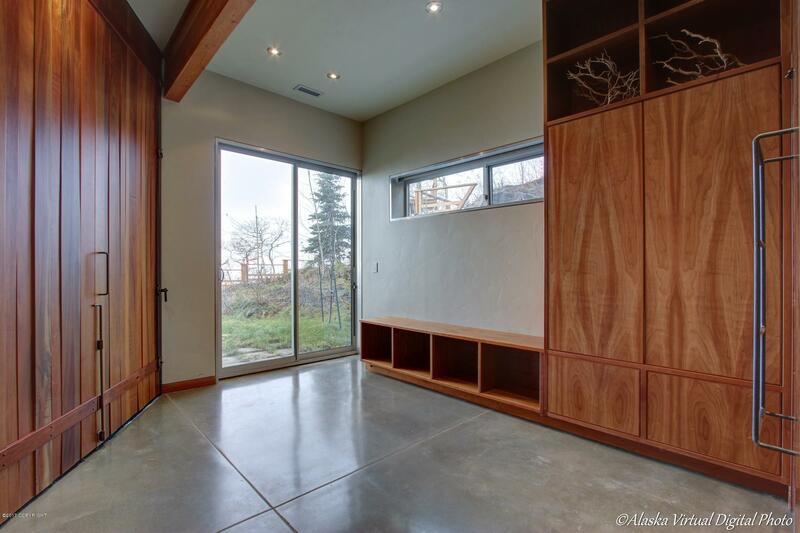 A bonus room downstairs can be opened to make a large bedroom or rec room or closed off as another bedroom with built-in Murphy bed. 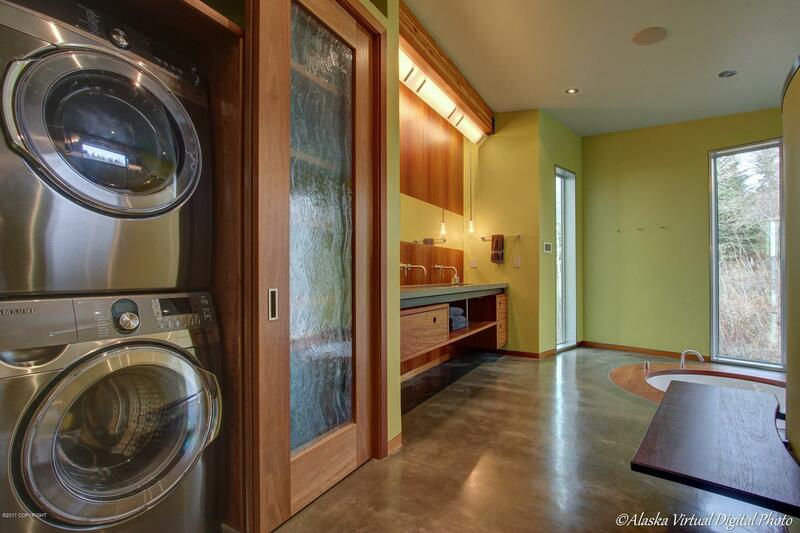 There are two laundry rooms one on the lower level and one off the master. 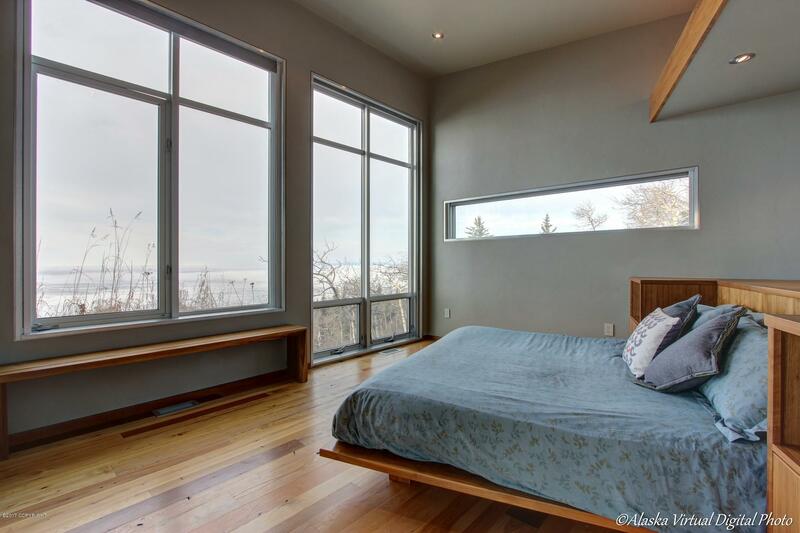 The top level offers a unique arrangement for privacy between the bedrooms. 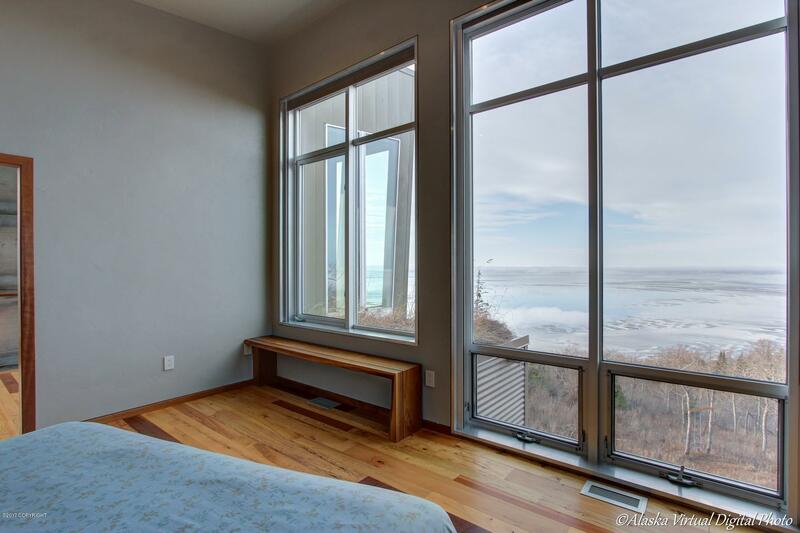 Each bedroom has its own bath & built-in custom furniture including a platform bed in the master & Murphy bed in the 2nd bedroom. 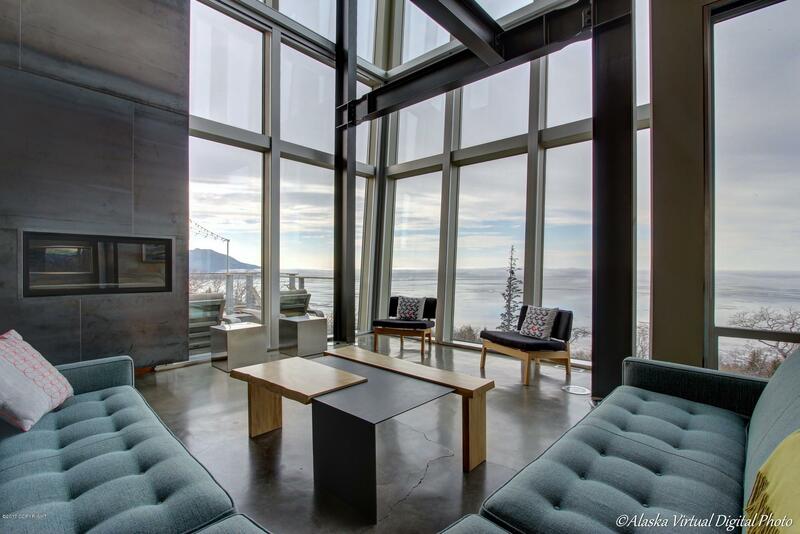 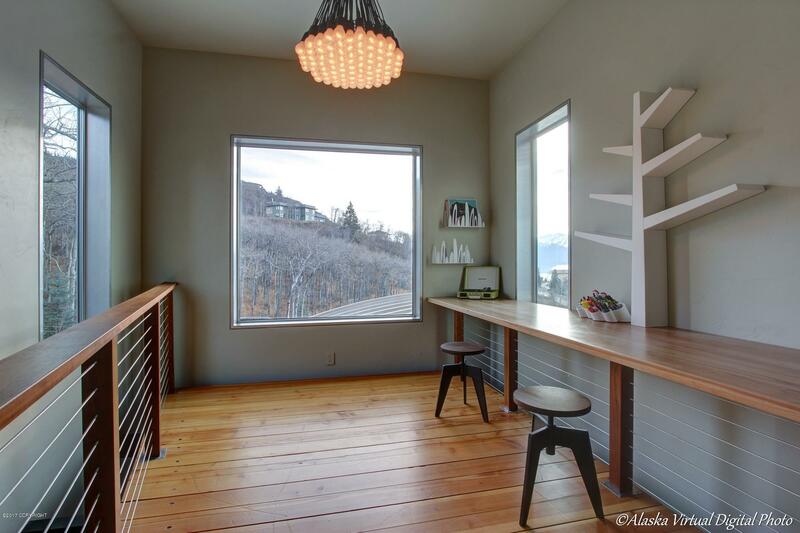 The lofts with view can serve as office or study areas. 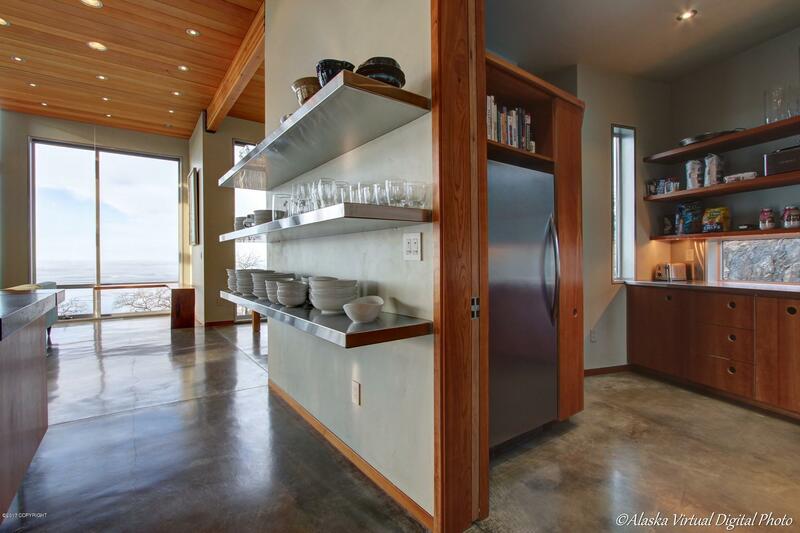 Recessed window coverings in stainless housing disappear to maintain the minimalist design. 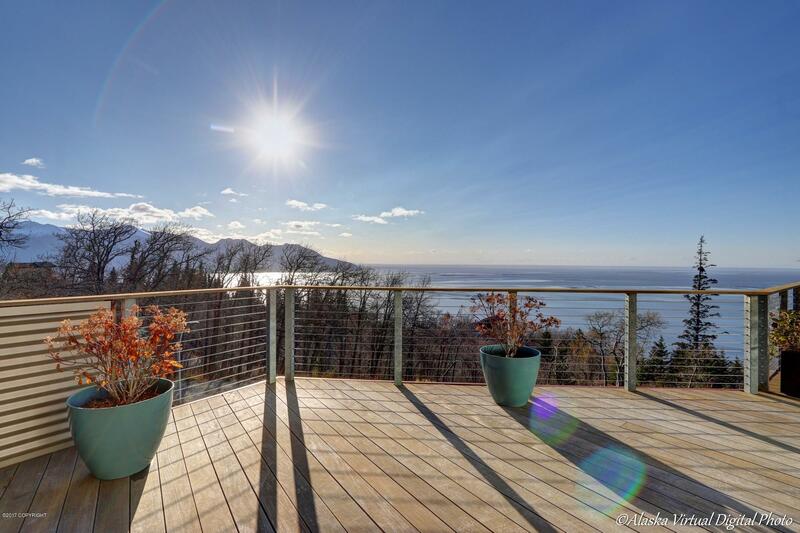 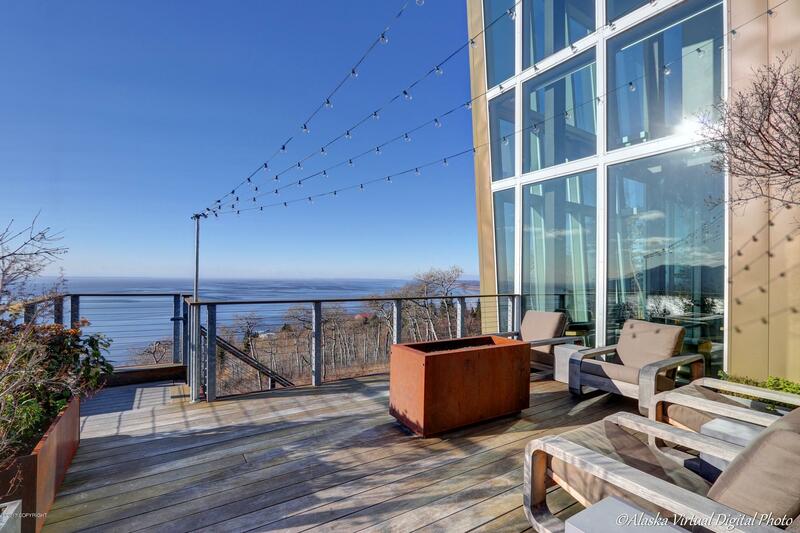 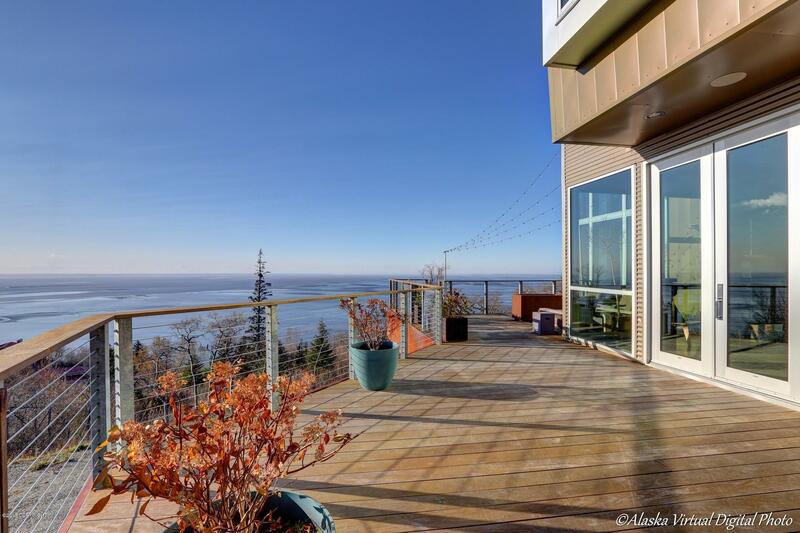 Over 1,700 of Ipe decks offer fabulous vistas of sea and land. 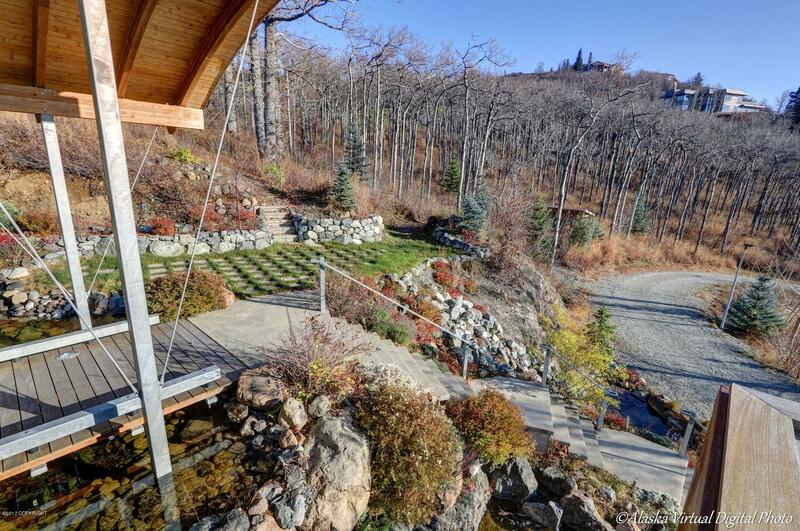 A spring-fed pond, lovely perennial landscaping and multiple water features with connecting tumbling water falls and ponds greet guests as a bridge crosses a stream to the front entry. 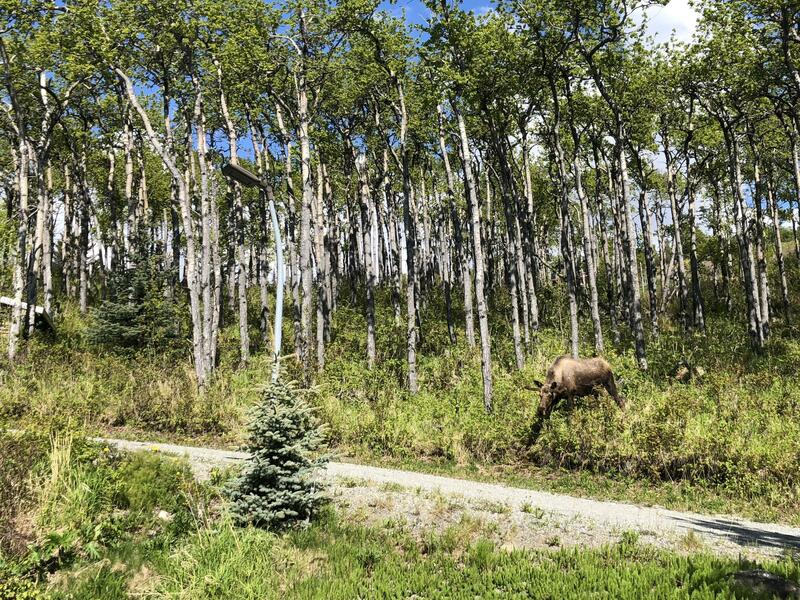 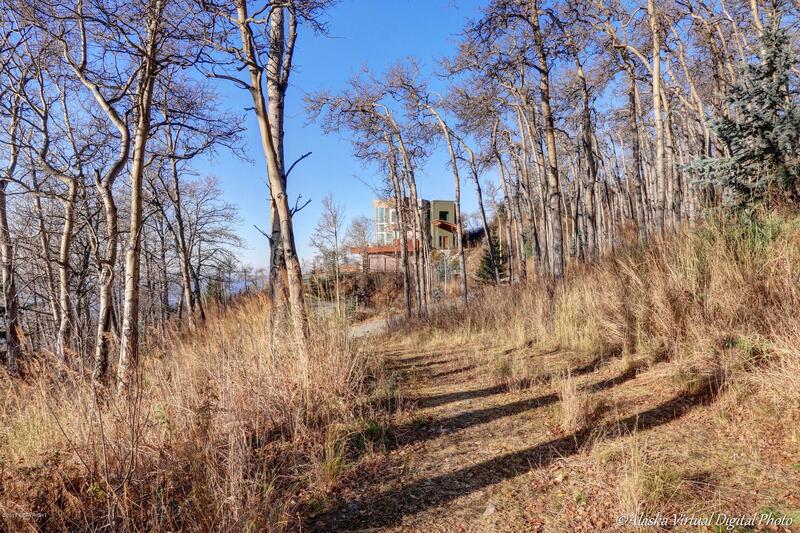 A fenced lawn with custom tree house offers protection from wandering moose. 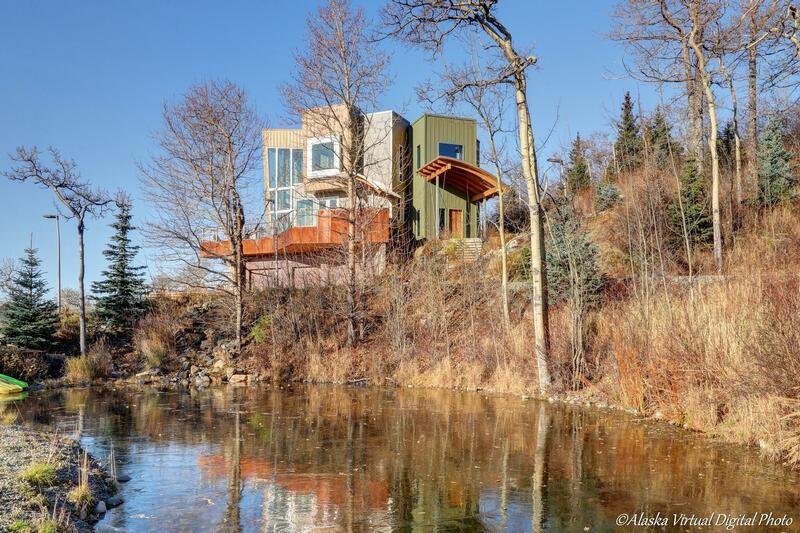 The large shallow pond is perfect for small craft and a quick dip. 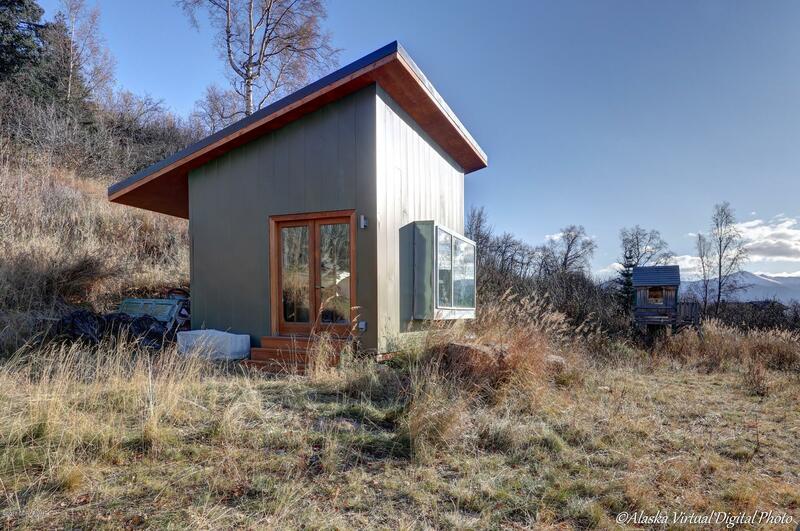 A modern garden shed matches the home. 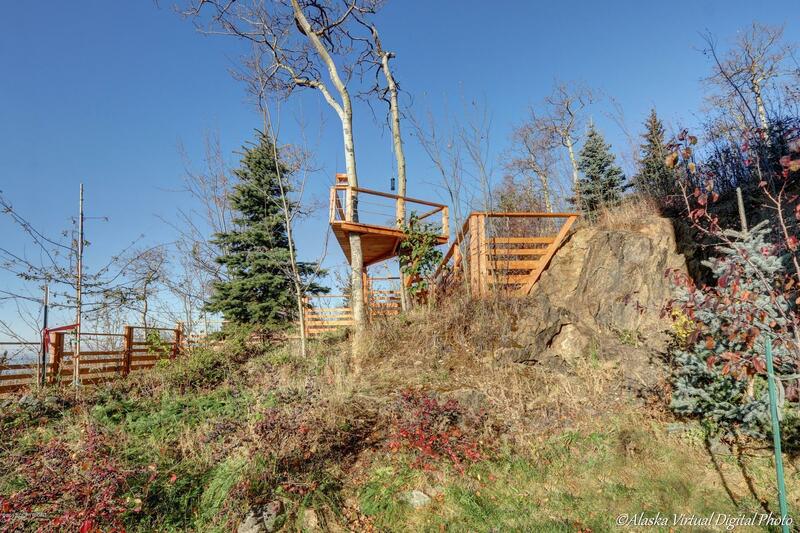 The fire pit on the property beckons. 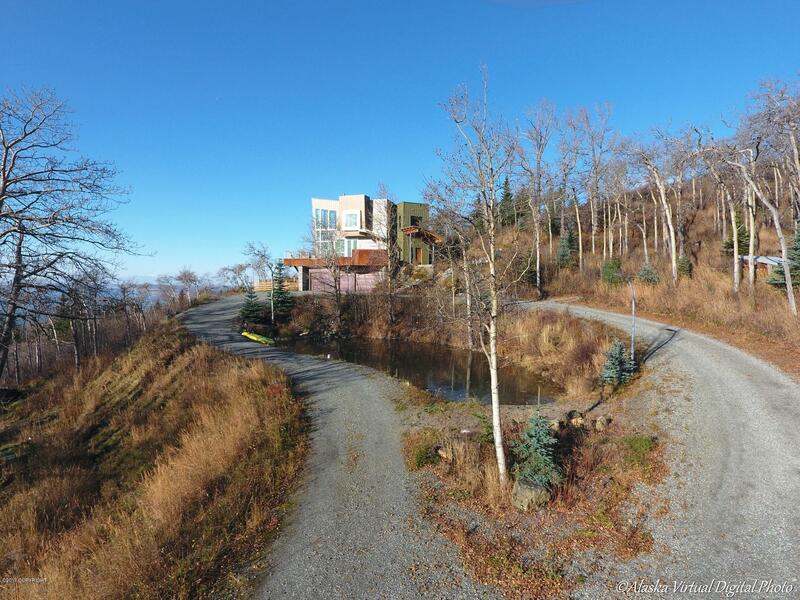 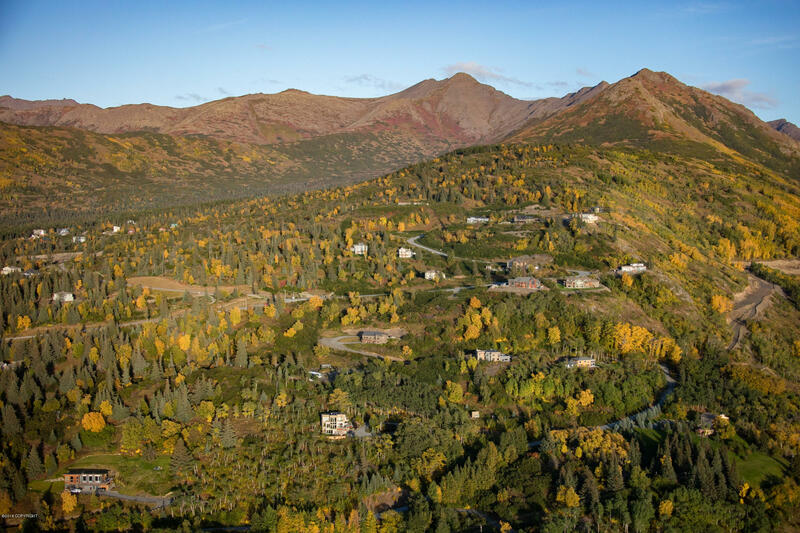 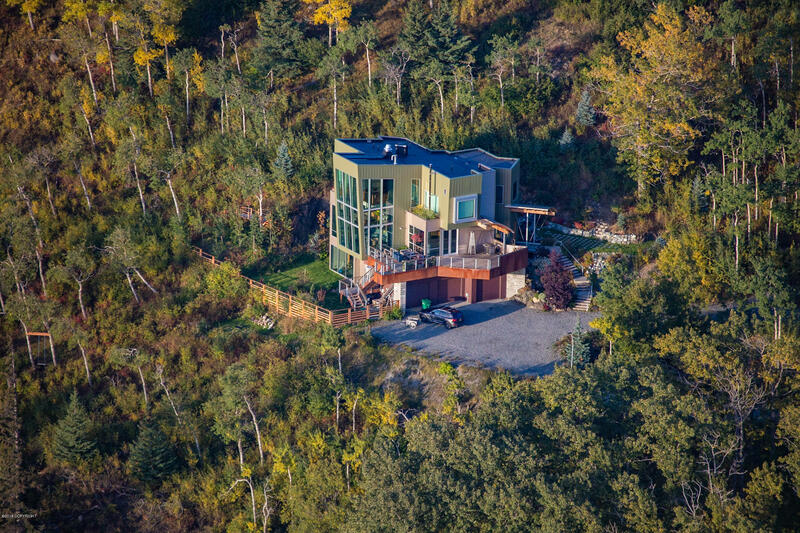 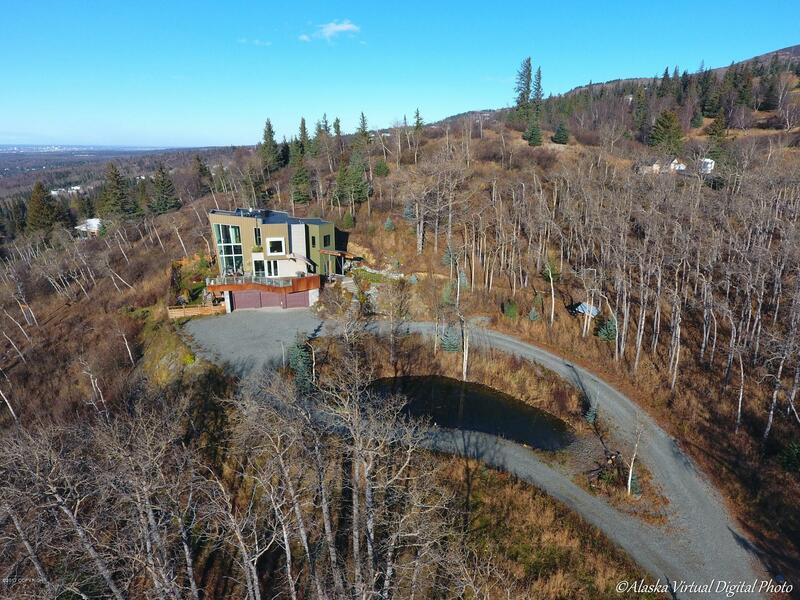 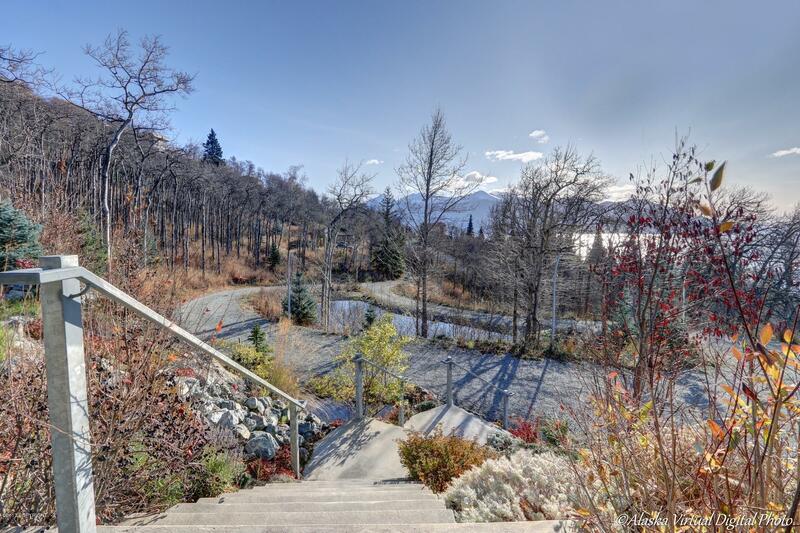 With trails cut in for hiking or cross country skiing on your own property, the home is approached via a circular gravel drive for ease of access for family and guests alike. 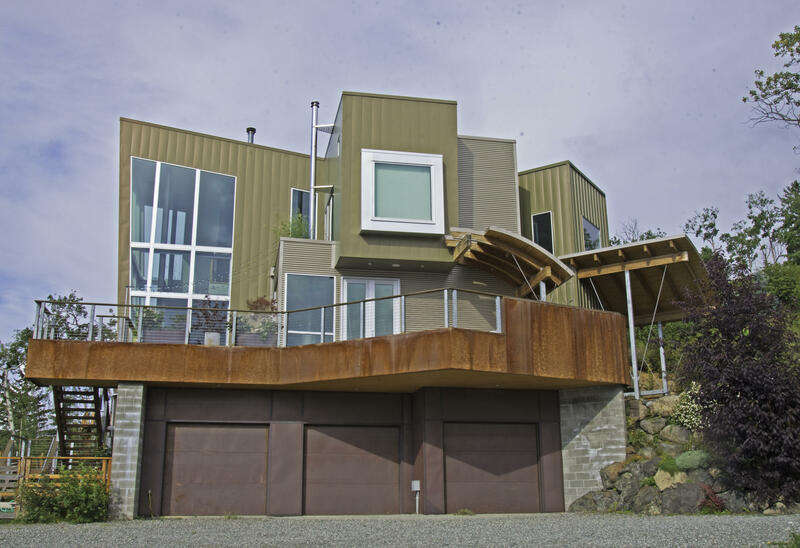 Over-engineered for earthquake and wind the home boasts a steel "moment frame". 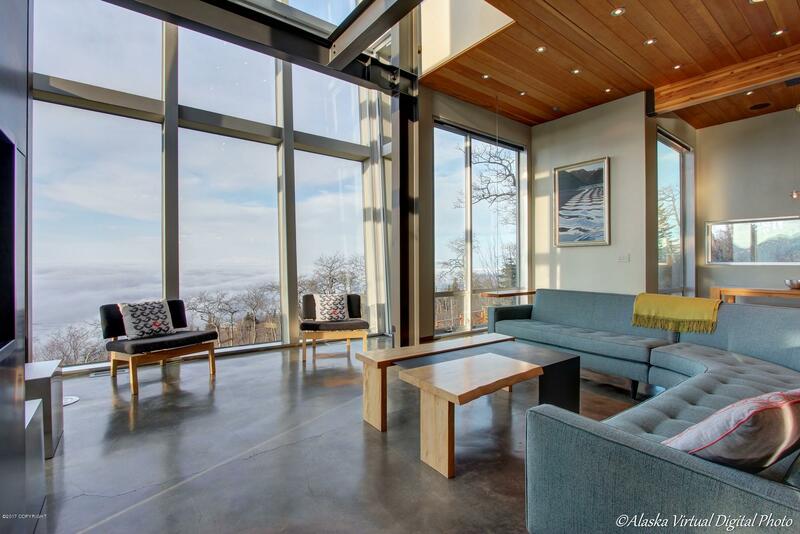 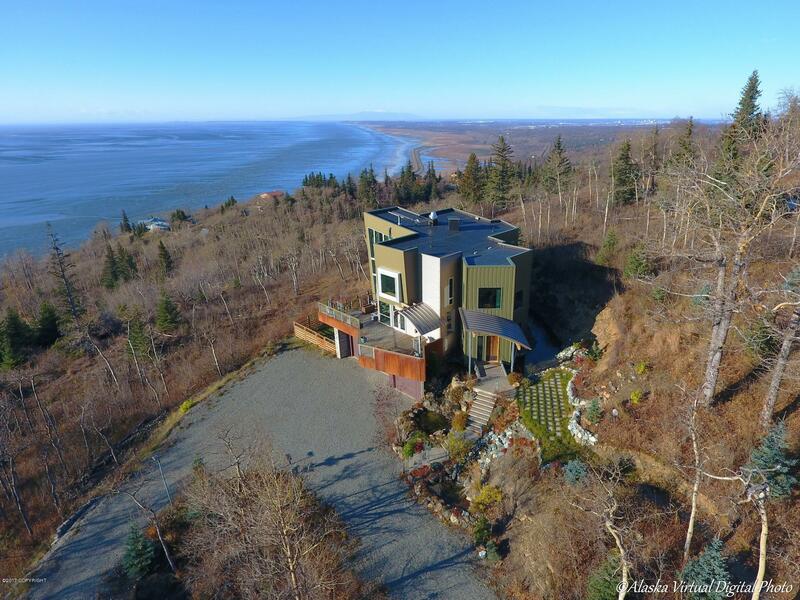 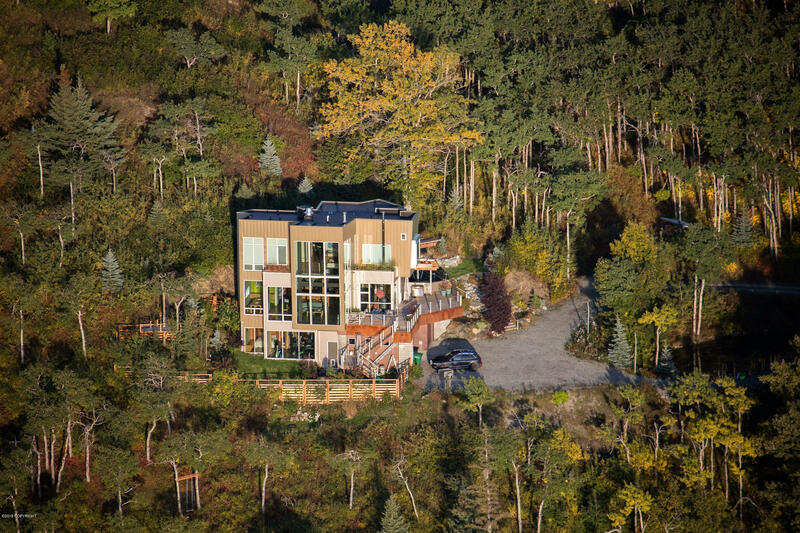 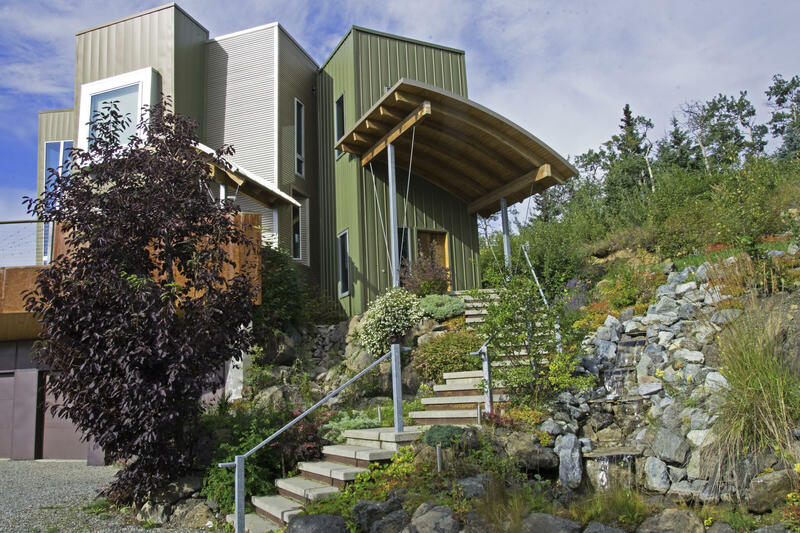 Built with eco-conscious sensibility, details such as passive solar gain design, soy insulation and geothermal heat pump were utilized. 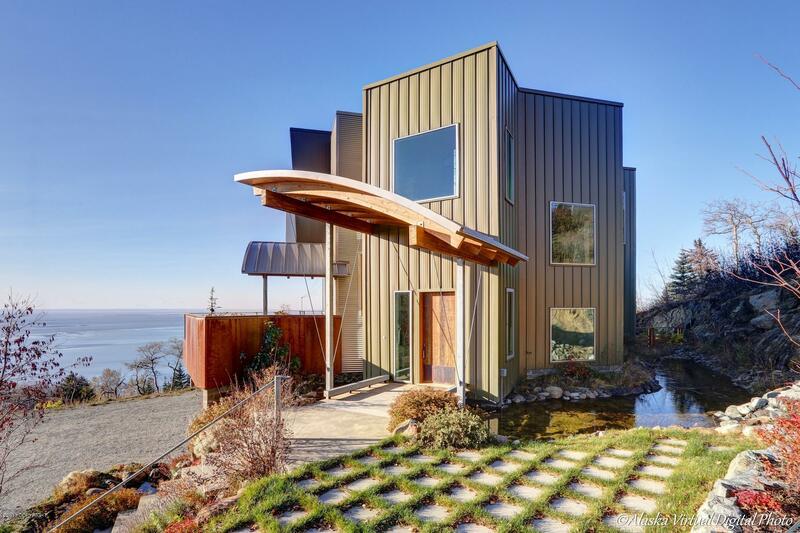 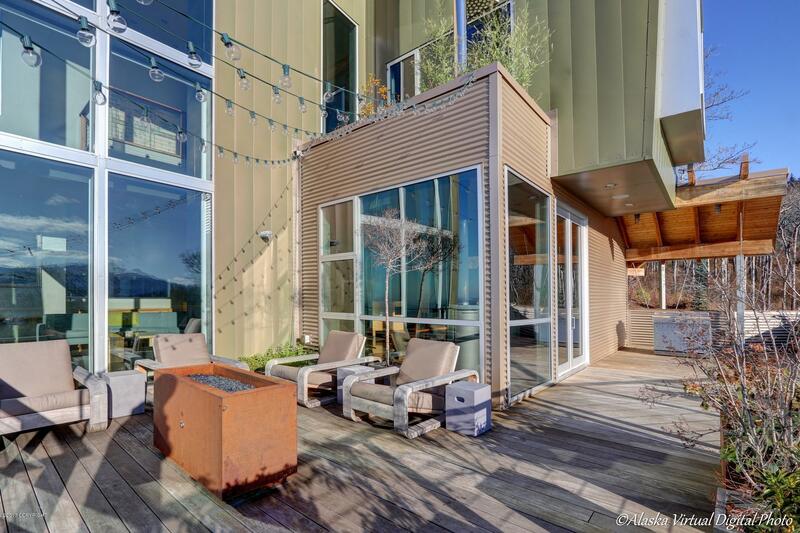 Constructed using state of the art recycled metal, rubber roof, aluminum argon triple pane windows, and reclaimed woods from various sources including old barns, dismantled factories, train tunnels, and military bases. 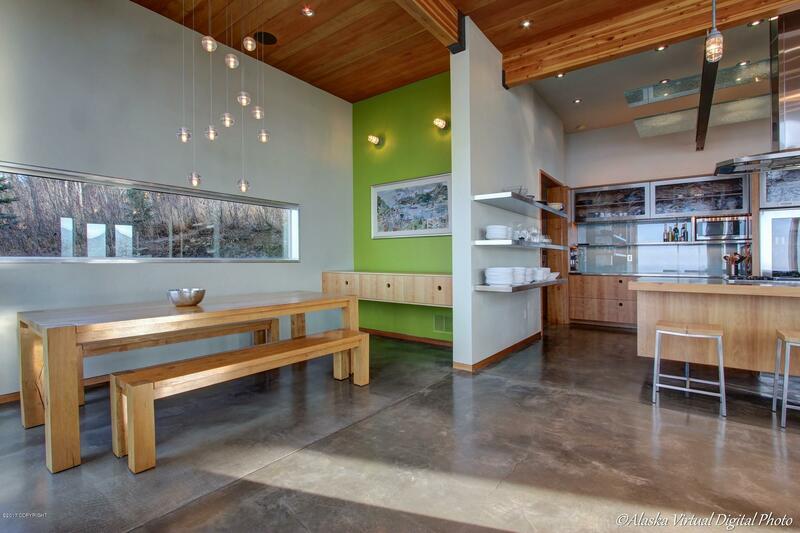 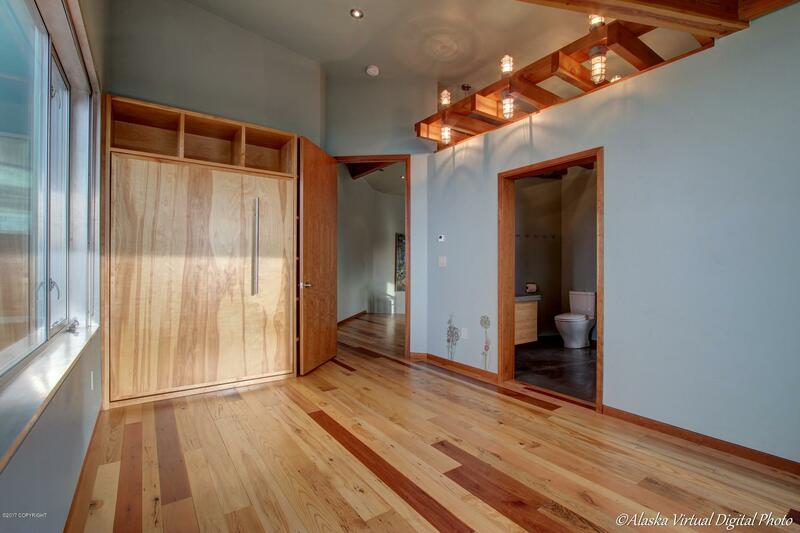 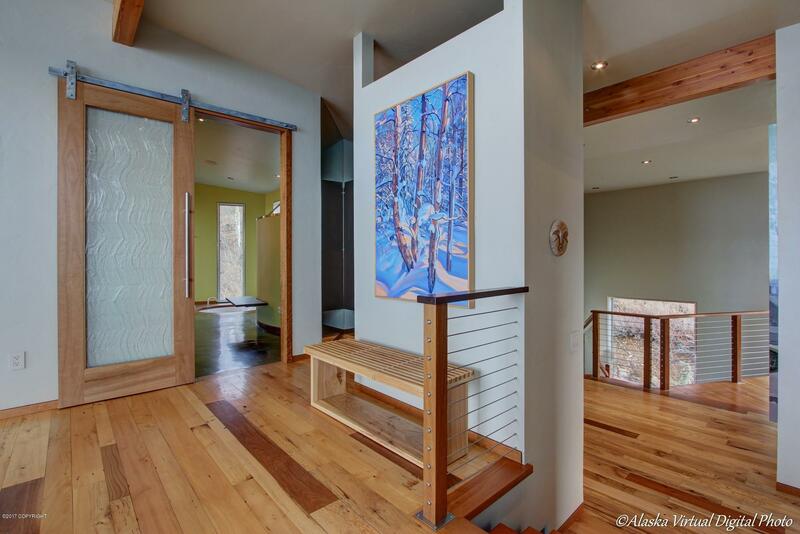 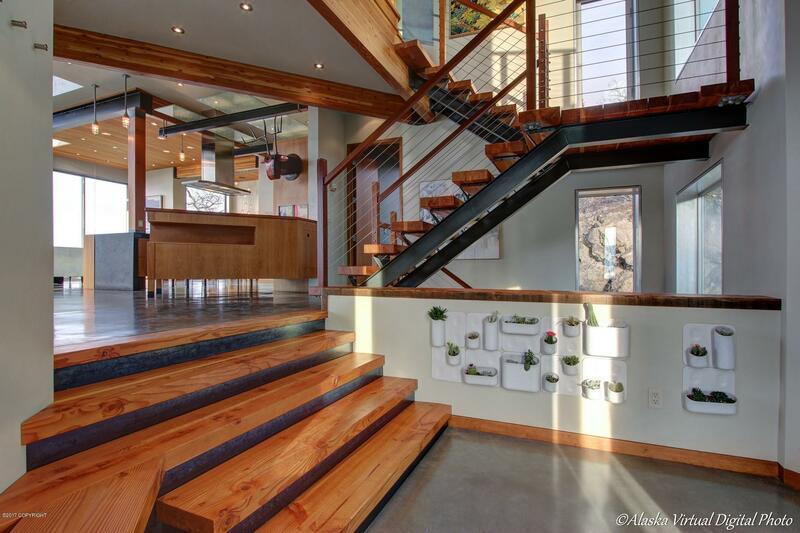 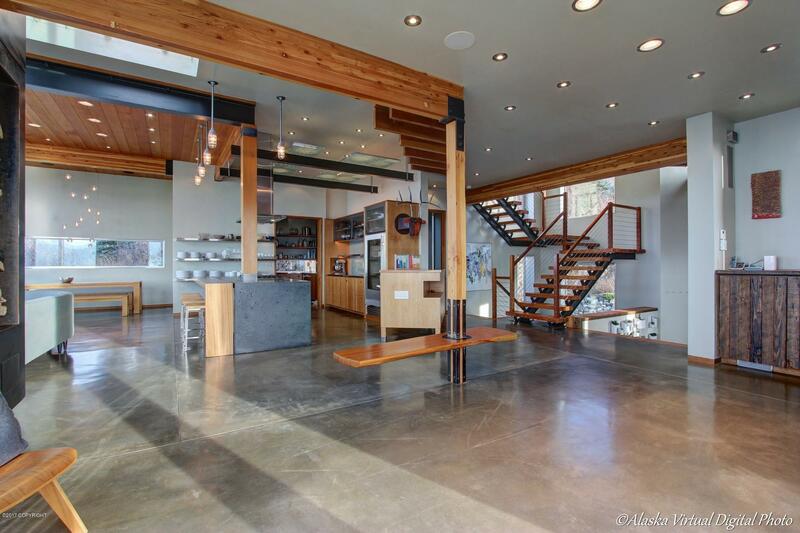 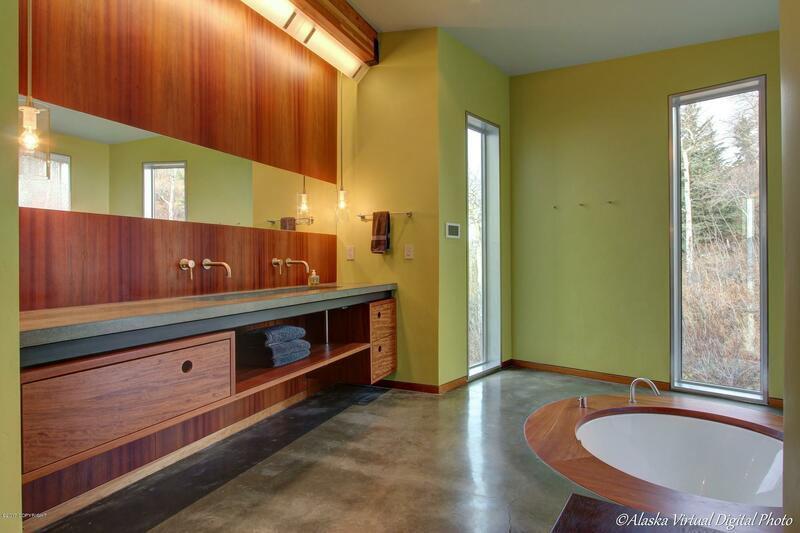 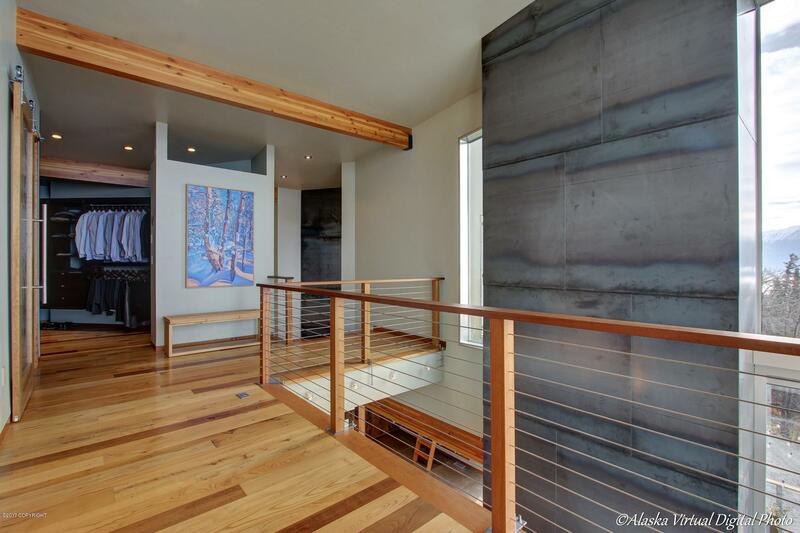 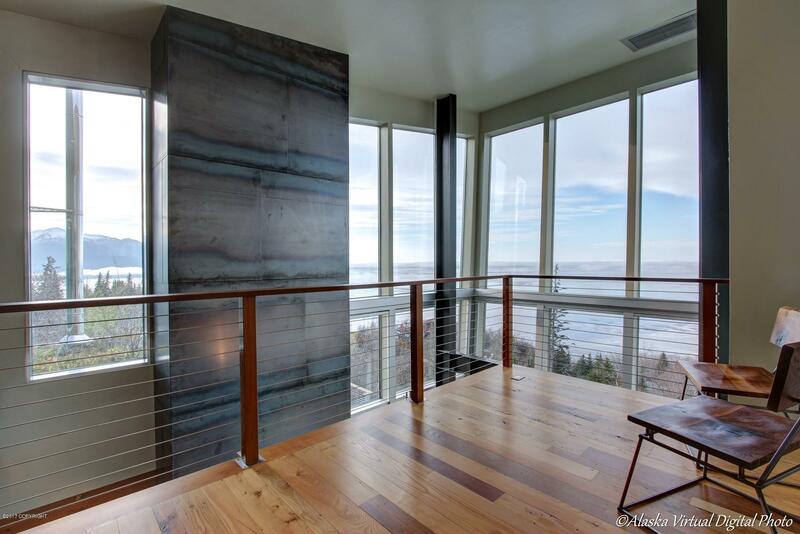 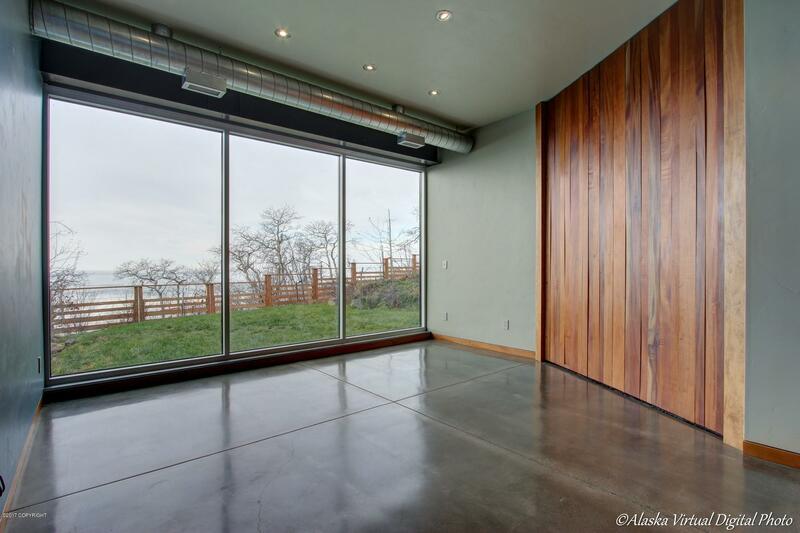 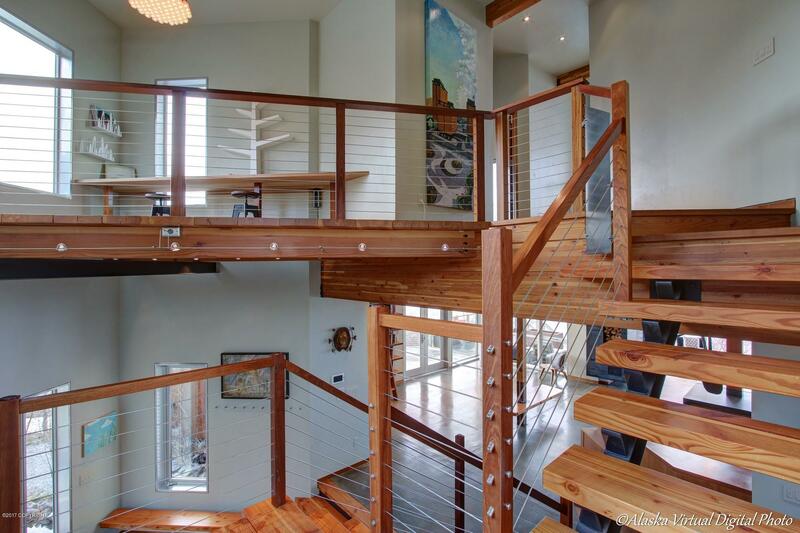 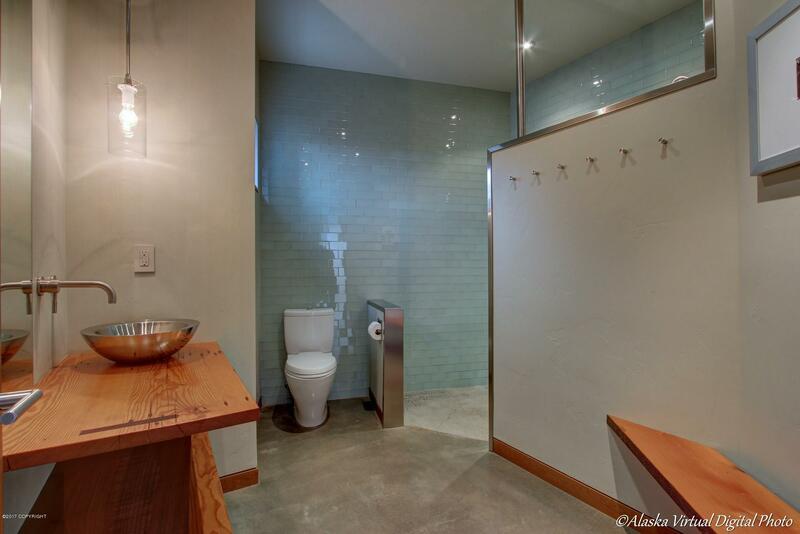 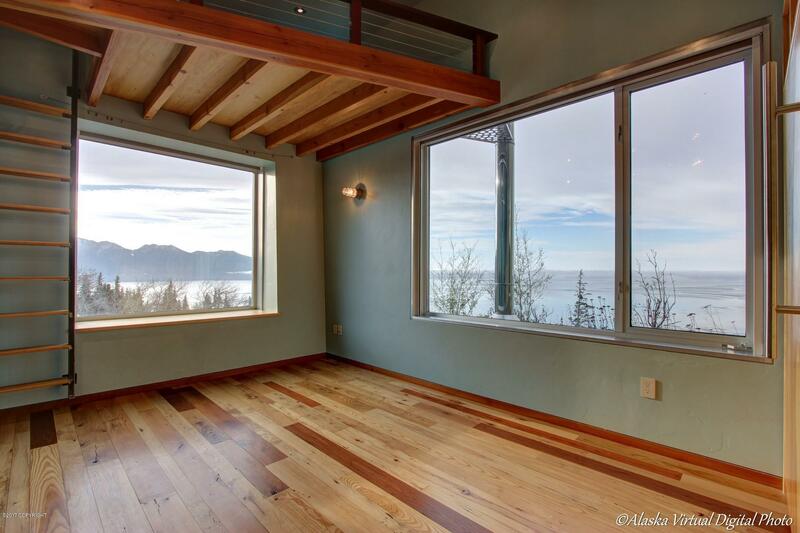 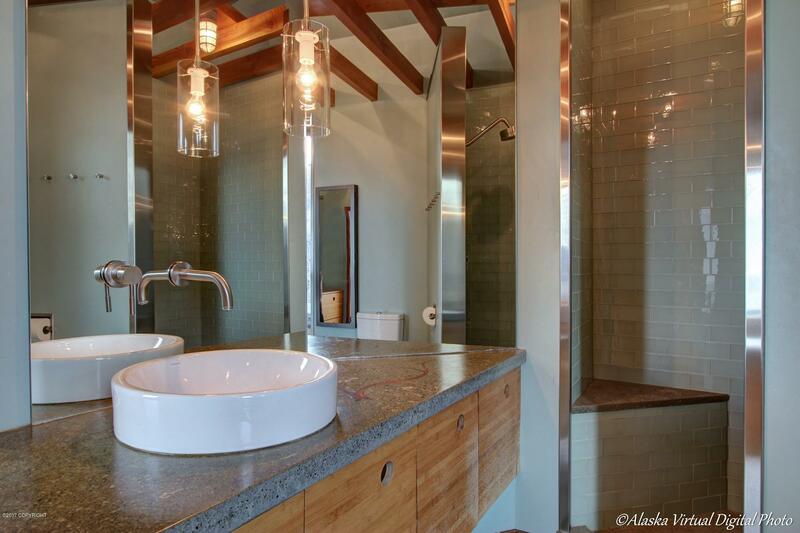 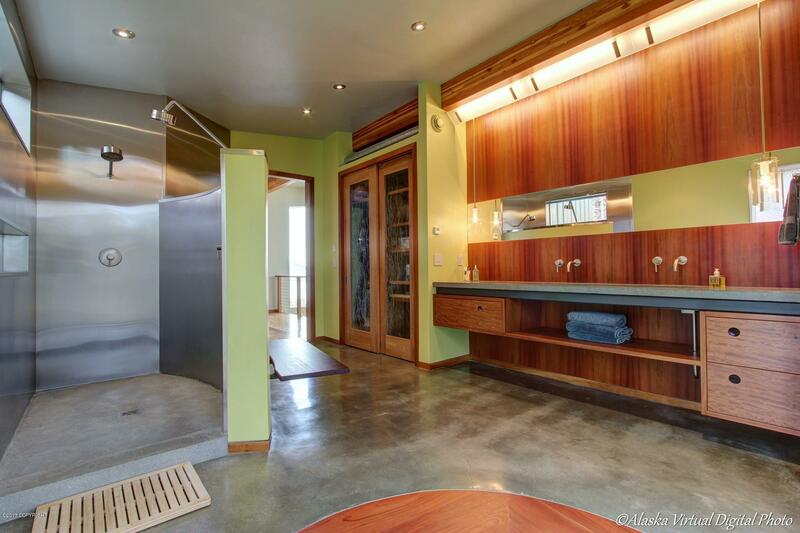 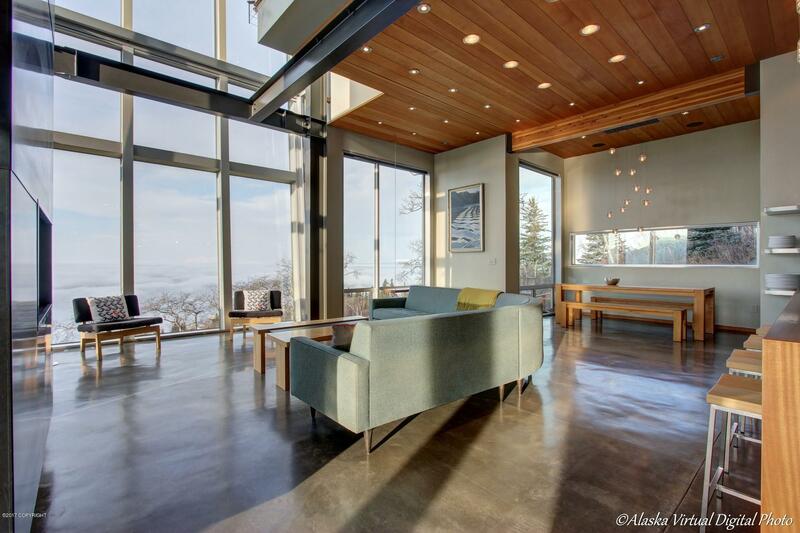 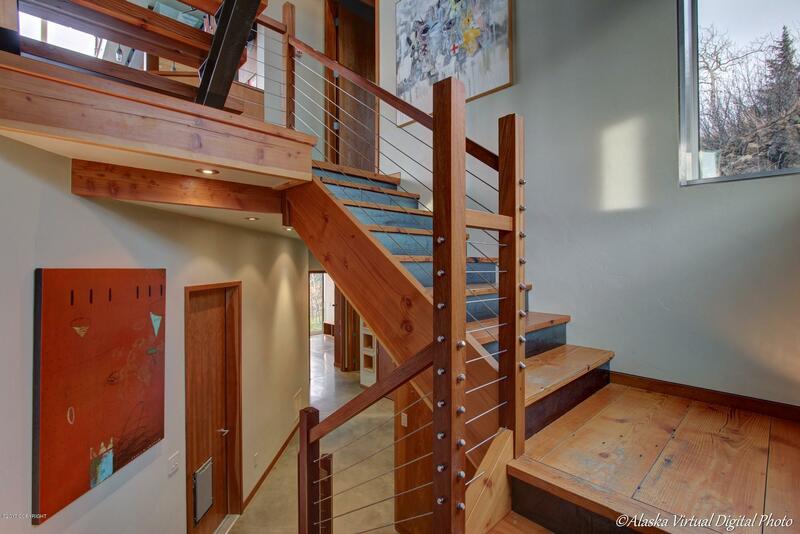 Multiple species of wood throughout the house include cherry, Douglas fir, walnut, bamboo and tropical hardwoods. 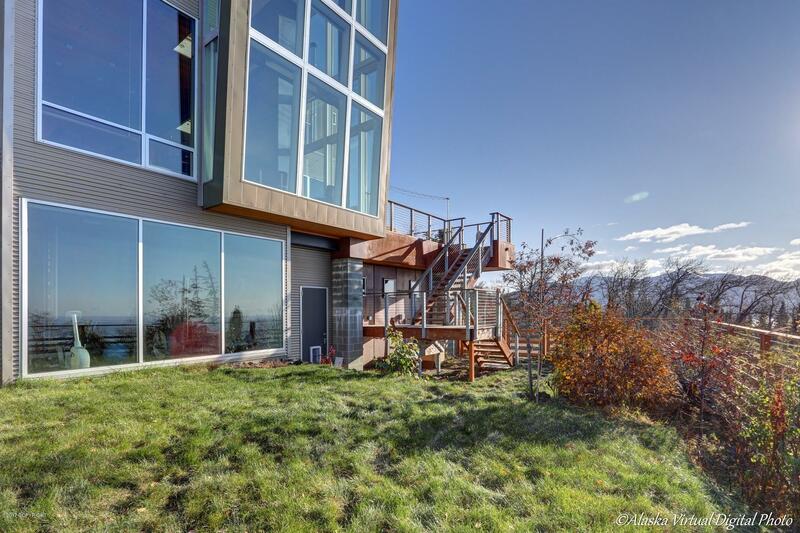 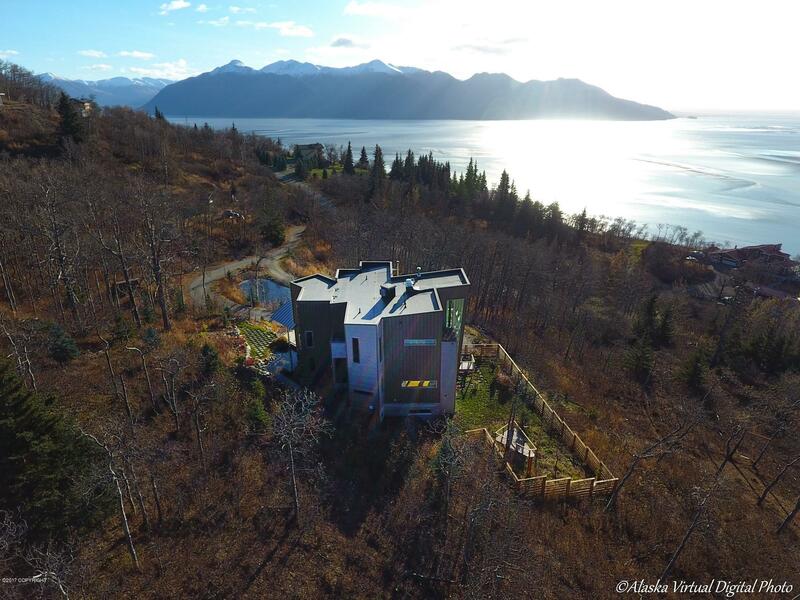 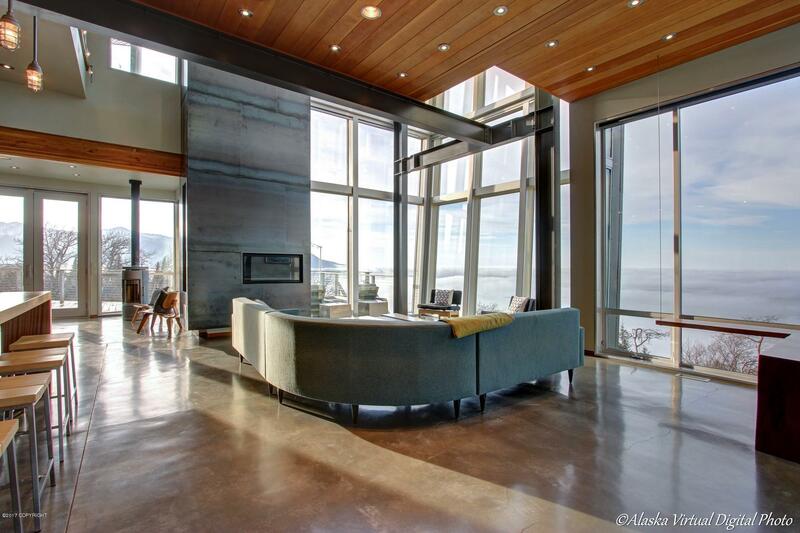 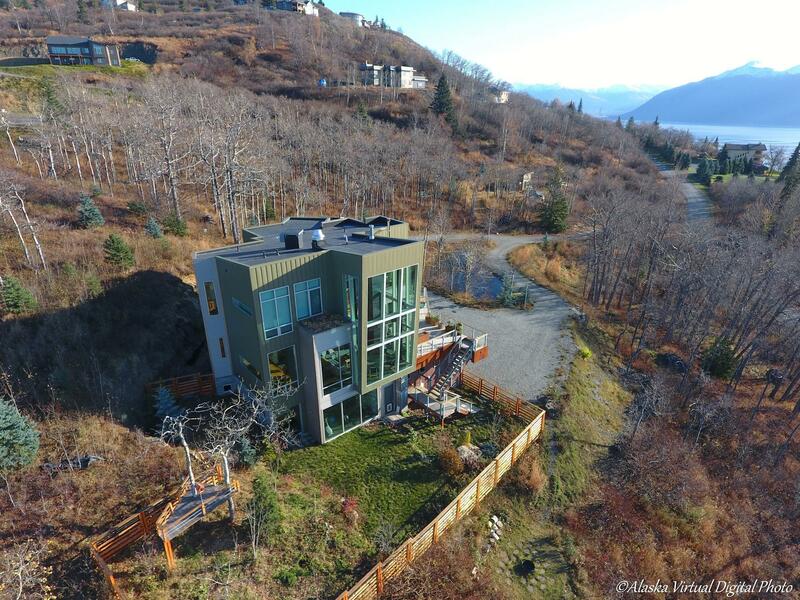 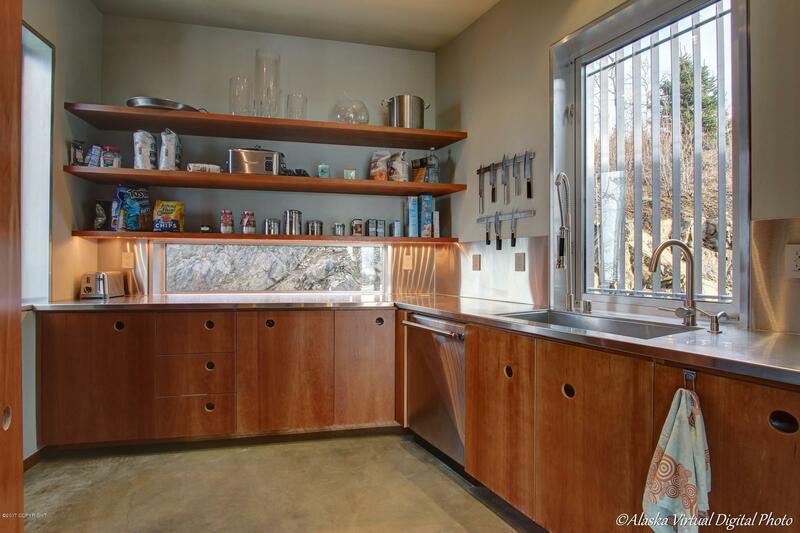 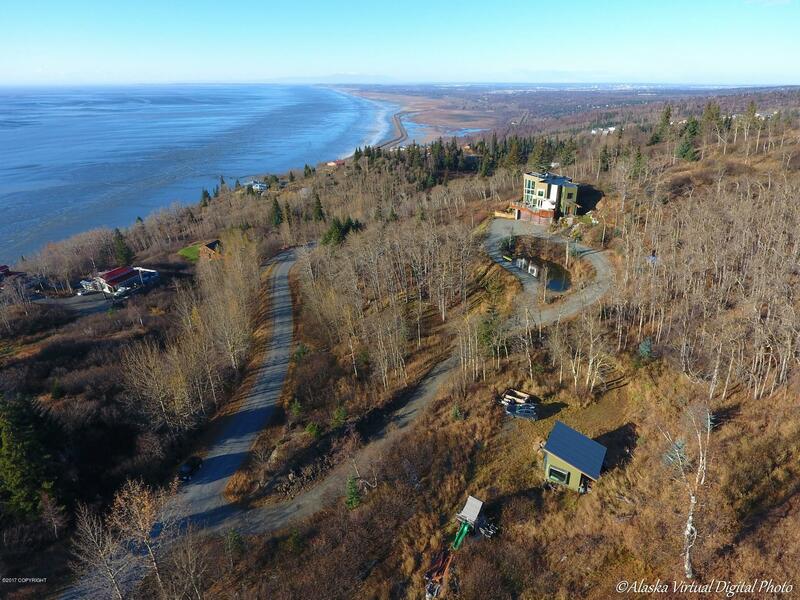 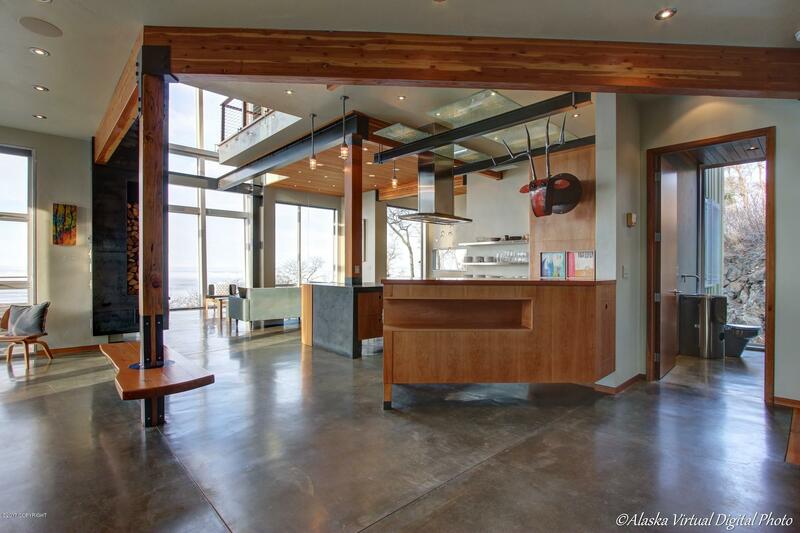 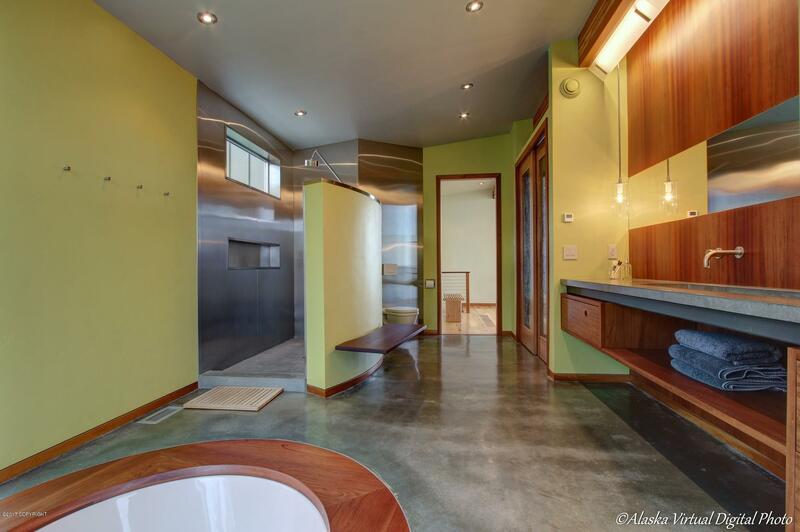 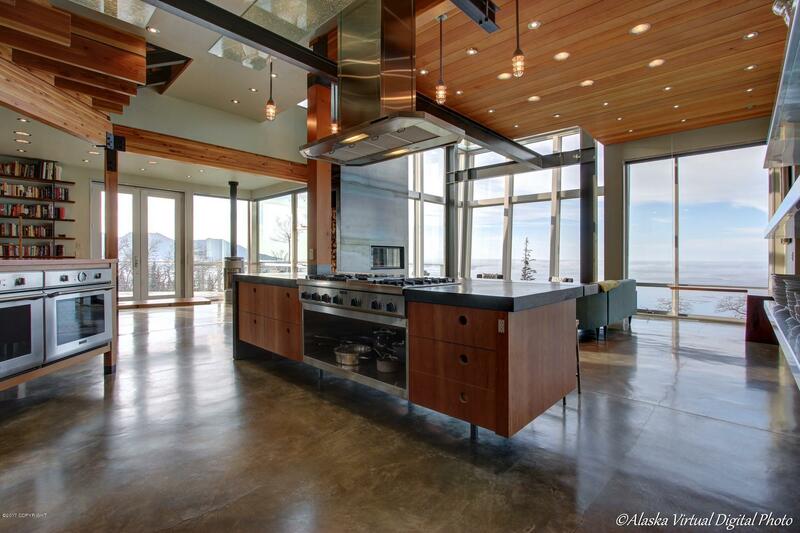 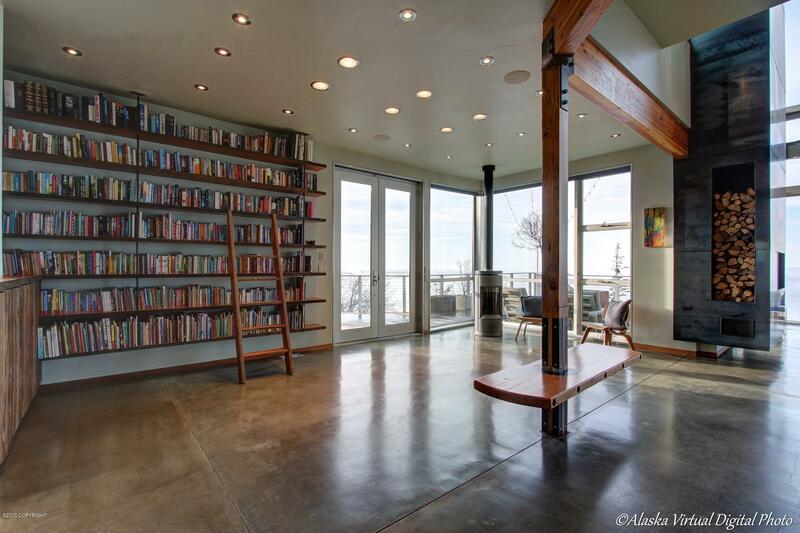 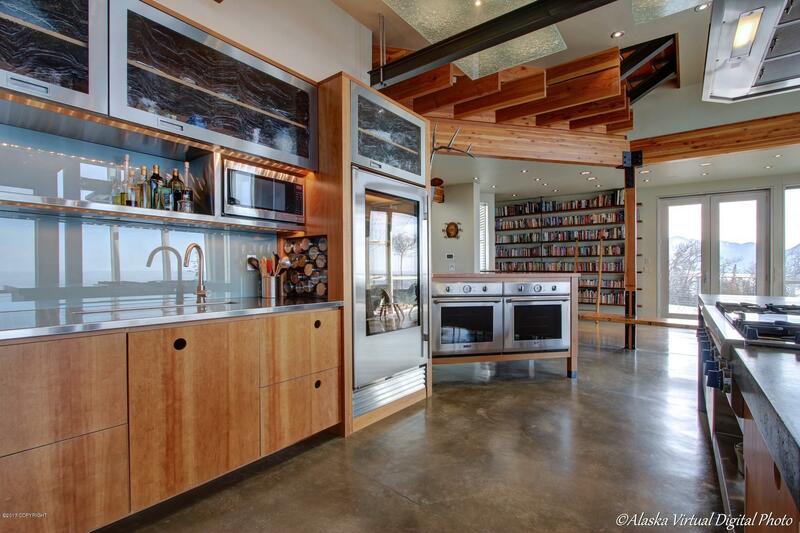 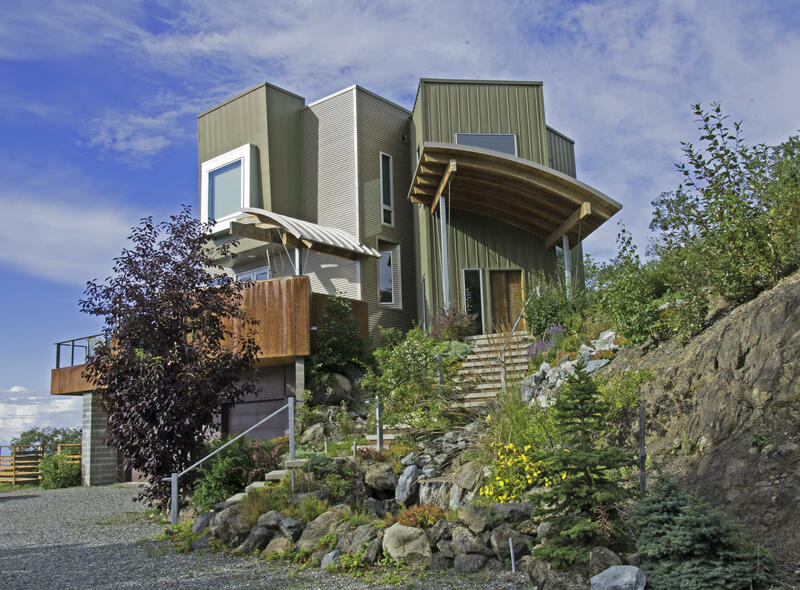 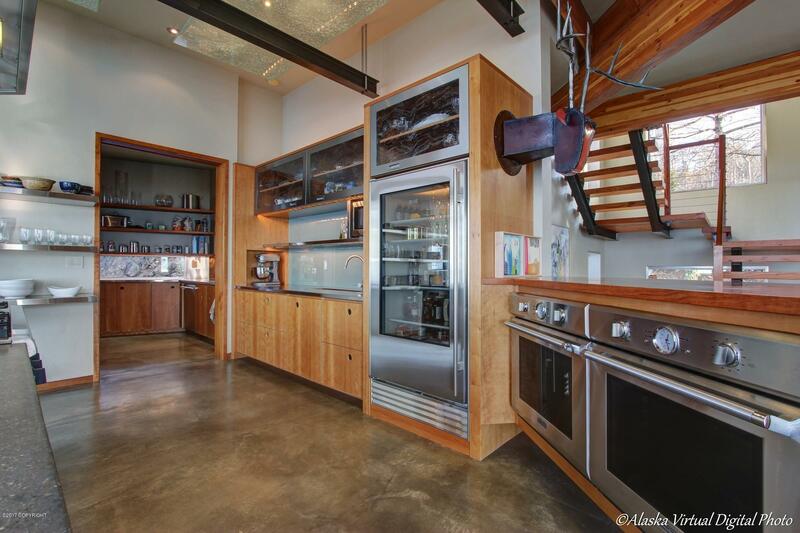 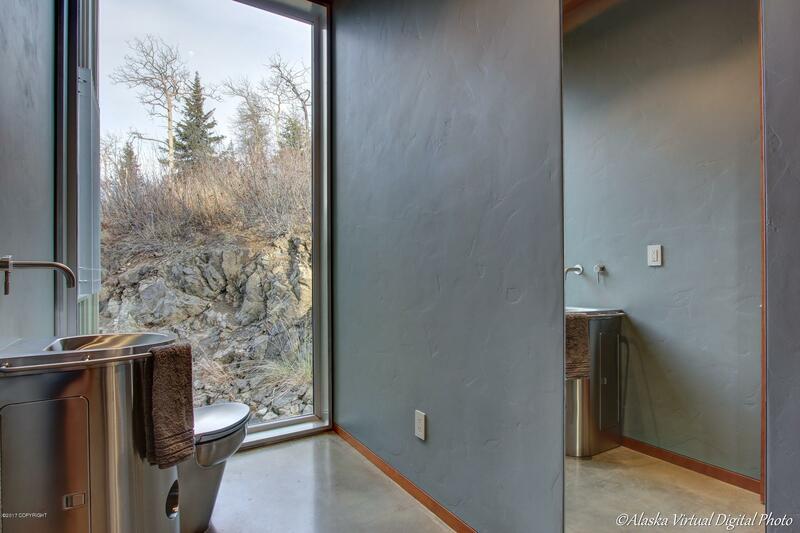 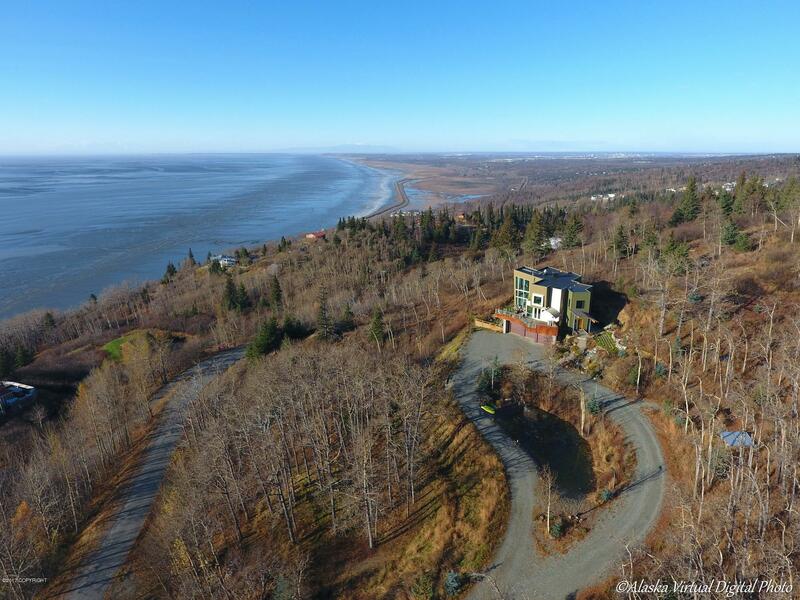 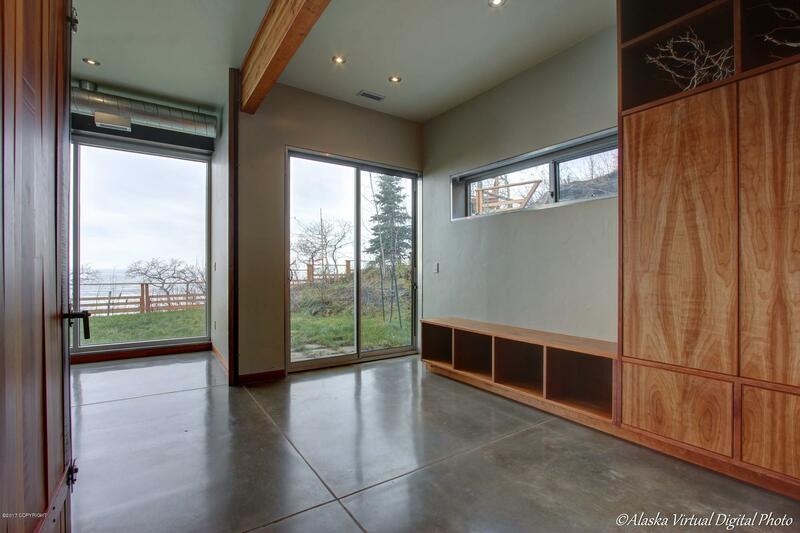 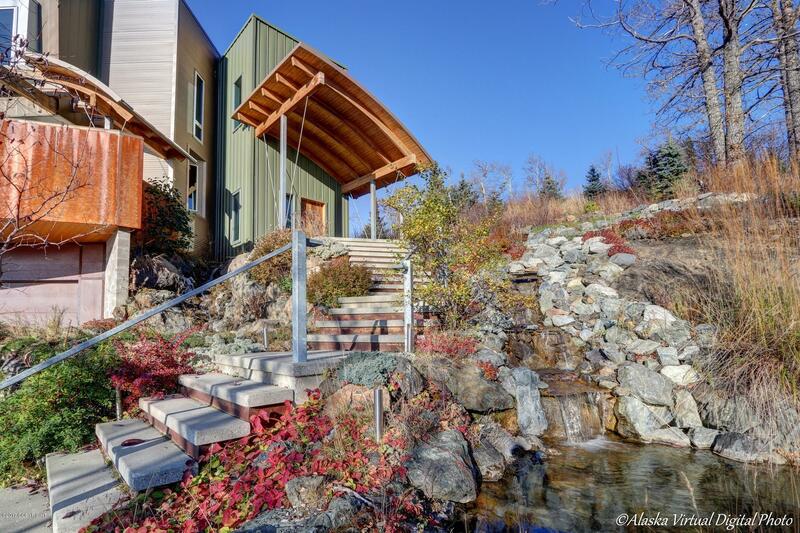 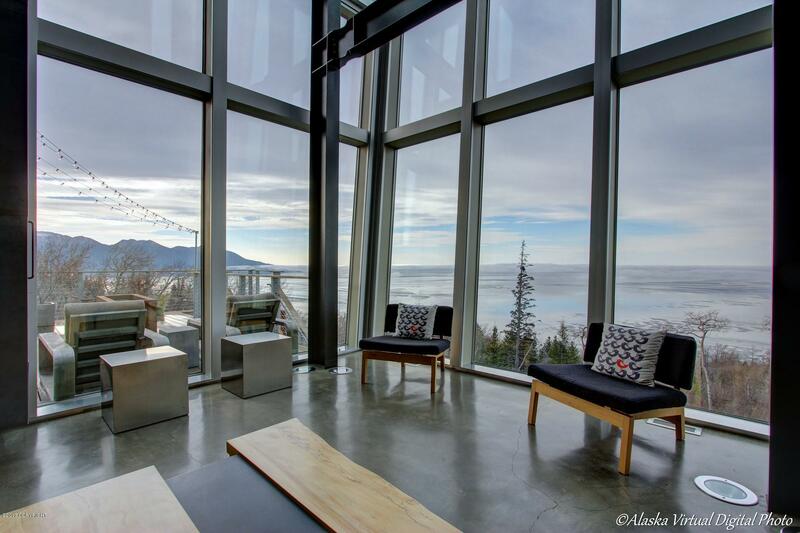 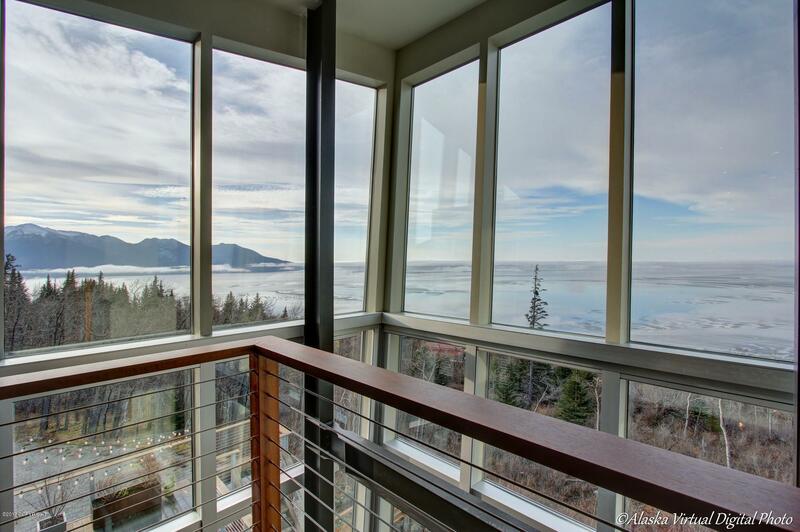 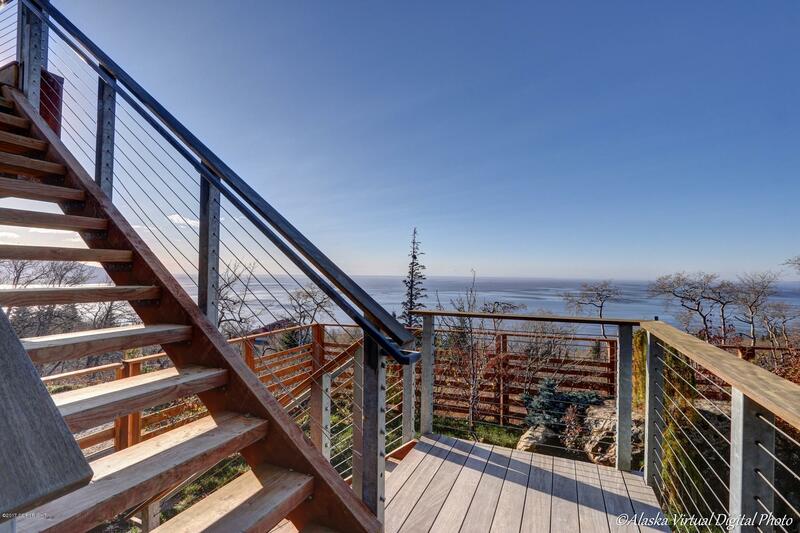 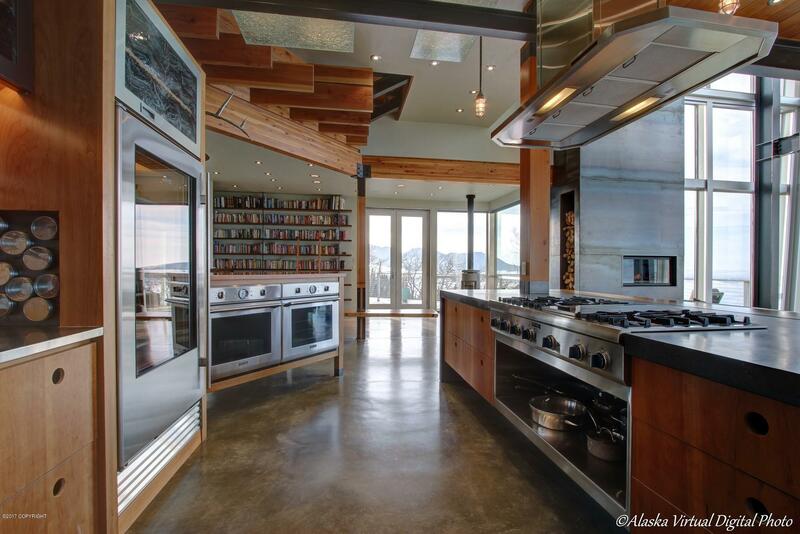 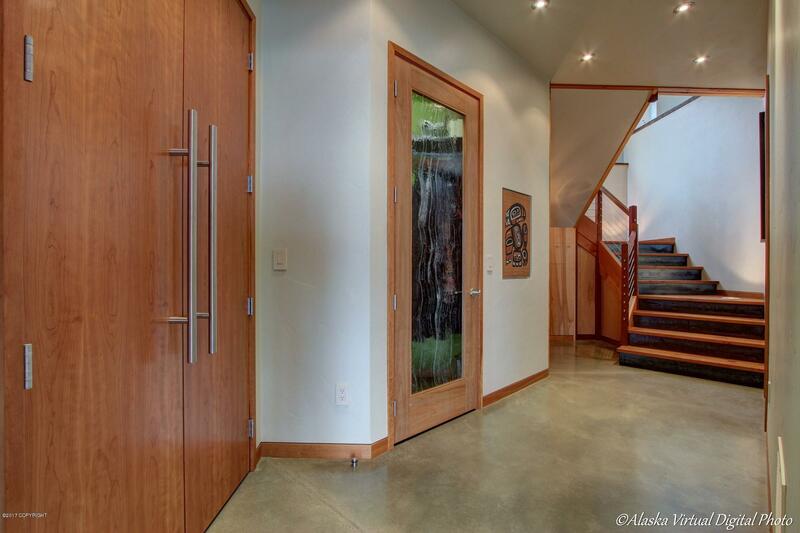 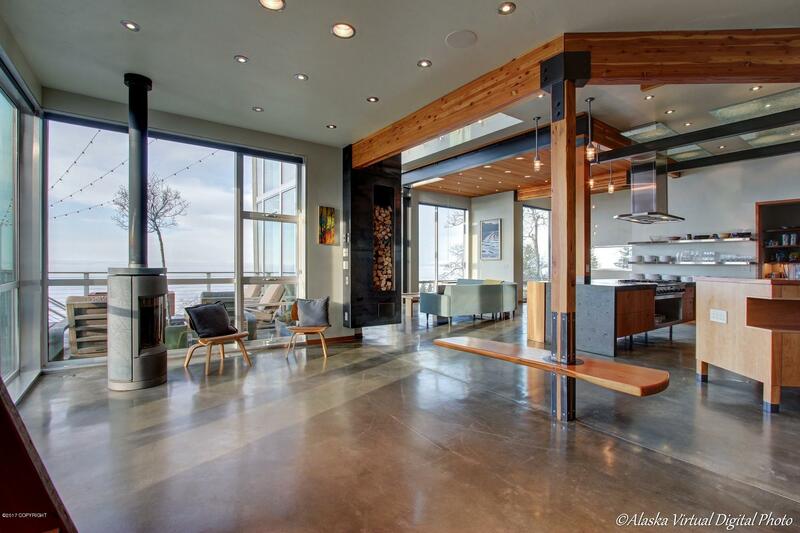 This home was designed and fabricated for low maintenance and total enjoyment of the Alaskan lifestyle. 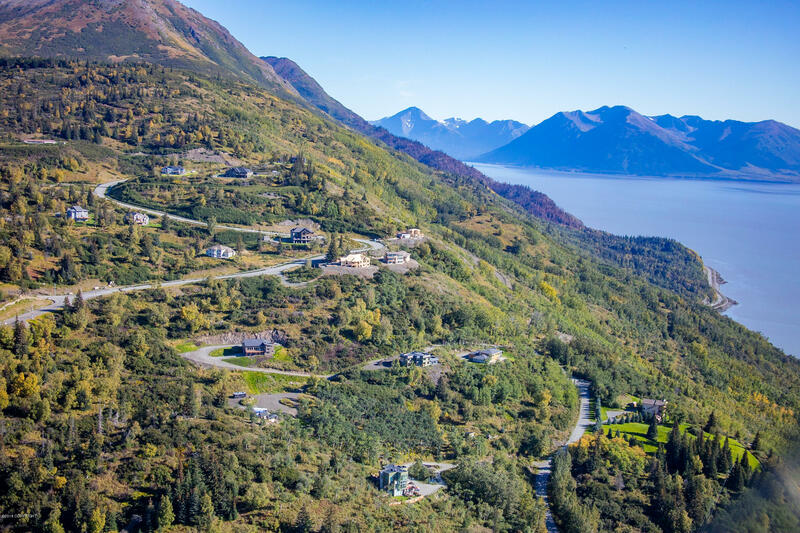 A 2nd lot of 49,457 sq ft. adjacent to Villages Scenic Parkway owned by the Seller can be purchased separately. 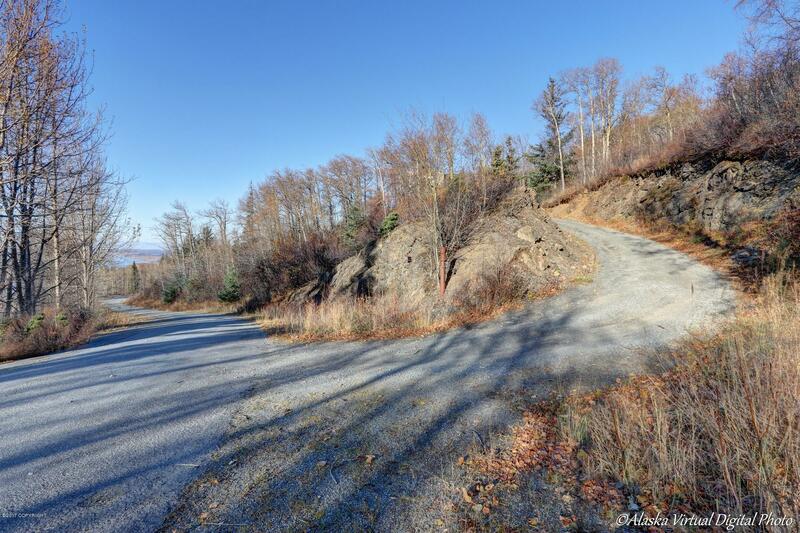 Priced at $135,000 this lot is offered at less than city assessment.